Today, I am so excited to share with you guys a fun contest. You may remember Muse Apparel from this post. I had the absolute pleasure working with them and am thrilled to be joining the Muse Apparel’s Style Off contest. 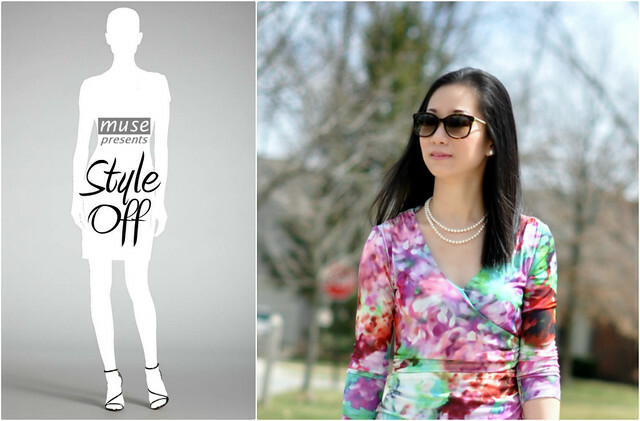 Muse Apparel is hosting a #StyleOff each week in April featuring the most stylish #FBloggers in the United States and Canada. Each week, two bloggers will style a single #MuseAppareldress in their own fabulous way. You will have a chance to vote for your favorite blogger (details to follow). The blogger with the most votes will win the title of “Style Muse,” and will be able to award one lucky voter with the dress featured! Sounds fun, right? I picked the Watercolor Floral dress for this contest for several reasons. First of all, I'm a huge fan of wrap dresses. It really enhances the body's natural curves. Second of all, the watercolor print is gorgeous and so easy to mix and match with other pieces. I styled this dress 3 different ways and will be featured them throughout the week. You can get a sneak peek here. I would really appreciate if you have a minute to vote for me. You must “like” Muse Apparel’s Facebook page to vote. In return, one of my voters will have a chance to win the dress I am wearing here (in a size of your choice). This campaign will last for one week starting now and ending on Friday 4.12 at 6:00 pm. The winner will be announced on the Muse Apparel Facebook page as well as on this blog. you look so fabulous! i like the big sunnies and the watercolour shades on this dress - we're so ready to take on spring here! yes definitely we should meet up soon - we should go to a park! Loved how you styled this dress! Very pretty for Spring! That is the perfect dress for this season. I love the colors. What a fun contest, and I am so glad you get to participate. You look great! So demure, love it! Love how you changed up the hair in the 3 looks too (read the newer posts first, hehe). Wow! I would really appreciate your choice.You look great in this dress.